The filter allows finding files in search results. 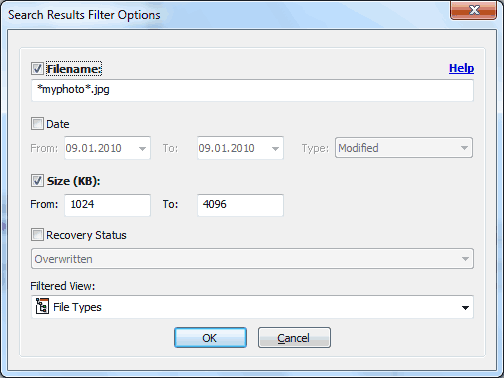 Use a filter if you know at least a part of the file's name, its creation or modification date, or size. Files found after filtering can also be flagged (either individually or as an entire folder) for subsequent saving. File Name—sets the filename mask. Date—sets the range for creation or modification date. Size—sets the range for file size. Recovery Status—sets the minimal status for deleted files. Filtered View—sets the folder view used to display the filter result.